It ain't even here yet! A viable contender in the handheld market? Nvidia's made two fairly big announcements regarding its Shield handheld today: First, it's going to be a fair bit cheaper; second, it'll arrive at its new price on June 27. The previously $349 (about £225, AU$325) gaming device has been slashed to $299 (about £195, AU$325) - quite a considerable reduction given that it hasn't even shipped yet. For those who have already pre-ordered Shield (formerly Project Shield), you'll be charged the newer lower price when it ships, as Nvidia announced on its blog. "We've heard from thousands of gamers that if the price was $299, we'd have a home run. So we're changing the price of Shield to $299," it said. Nvidia also gave a concrete date for the Shield release - June 27. However, this is just the US release, and so far a UK date hasn't been announced. 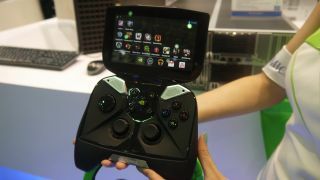 Speaking to TechRadar recently, Nvidia said that the plan was to see how the handheld fares in the US and Canada before expanding around the globe. But could the price drop a sign that pre-orders aren't going as well as hoped? Or is Nvidia just hoping to scoop up even more enthusiasts who can't wait to get their hands on the 3DS and PS Vita's new challenger?